Pharomachrus is a genus of birds in the family Trogonidae. Pharomachrus is from Ancient Greek pharos, "mantle", and makros, "long", referring to the wing and tail coverts of the resplendent quetzal (the second h is unexplained). 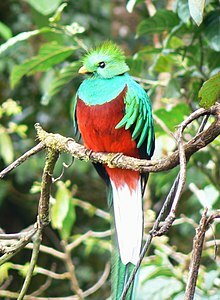 The five species of this genus and the eared quetzal, the only living member of the genus Euptilotis, together make up a group of colourful birds called quetzals. Pharomachrus auriceps Golden-headed quetzal eastern Panama to northern Bolivia. This Trogoniformes-related article is a stub. You can help Wikipedia by expanding it.